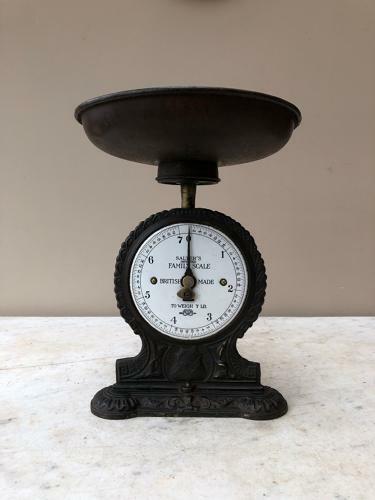 Early 20th Century Cast Iron SALTER FAMILY SCALES to Weigh to 7lb with Rarer White Enamel Face. Ornate base with SALTER diagonally. Wonderful clean & lovely condition white enamel face. Fully working scales with their original pan. When you turn them to the back a little piece of the bottom edge has been knocked. Heavy and so post is Parcel Force 48 for £12.98.